Subash's World: A thing of beauty, a joy forever indeed! Exactly a month ago, on Easter Sunday on March 31'st I was trying to save whatever battery charge that was left on my mobile phone just to make one important call. At around 3:45 PM I call my sister and ask her, "Suji, do you know where I am?". "No, where are you? ", she asks and I reply, "In front of the Taj Mahal". A "Wow" and an "Oh My God" from her only indicated how she was feeling and missing the moment I was going through that day. This was my first visit to the Taj Mahal and I cannot fully describe the incredible feeling I had when I saw this "monument of love". After using and hearing the word "awesome" thousands of times, here is one place where I found its true meaning. In fact I could spend an entire day here admiring this beautiful monument that left me speechless. The Taj itself is located in several 100 acres of space and the area leading to the Taj itself is beautifully adorned with other very impressive work of architecture. Be warned, it takes quite a trek to actually be in front of the Taj from the place autos or cars normally drop you. Once inside the premises you can take battery operated vehicles or camel driven carts to the ticket counters. From the ticket counters there is another good stretch of walking you need to do but this one's easier with the incredible sights of the monuments and other architecture on your way. You go past several other beautiful monuments and tombs of Shahjehan's first and second wife and one of Mumtaz's loyal maid too (courtesy of the Guide's narrative). 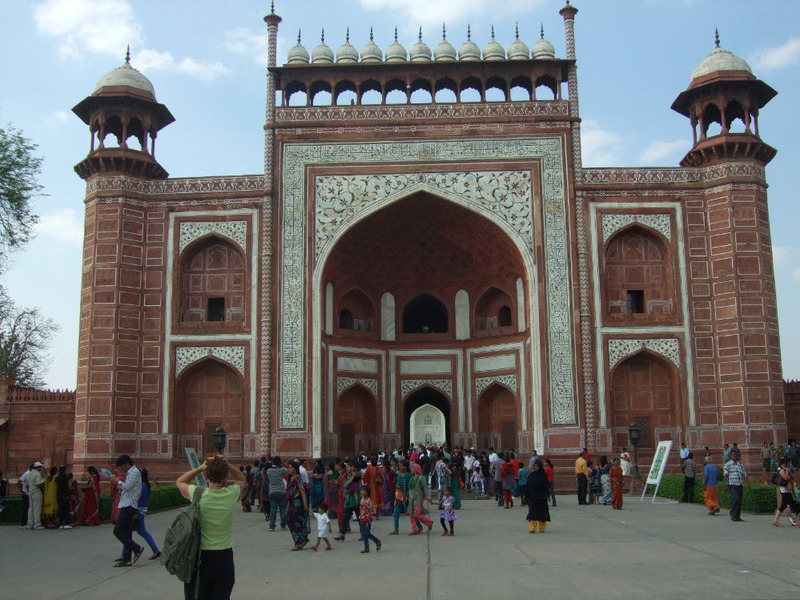 Chances are, you'll be going past the Great Gate, the Darwaza-i-rauza (pictured below) which is a quite a spectacle in itself. 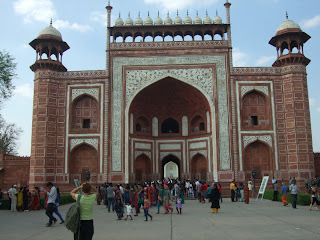 As you stand outside of this gate you can nearly catch a glimpse of the Taj. Was the foreigner in the pic above, holding her head in disbelief. I almost did the same. 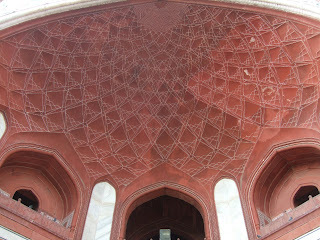 As you go by the gate here's the intricate design of the ceiling of the dome. When you get a glimpse of the Taj via the doorway it nearly takes your breath away and the closer you get the more it stuns you with its beauty. When I consider how architects, workers and the king himself could spend time and travel this far from Delhi and nearby places to build such a wonder, it is mind boggling. 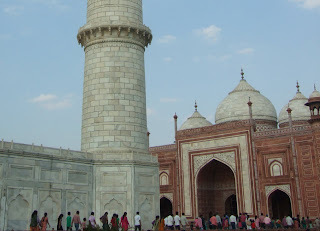 Agra is a three hour drive by car from Delhi but by the time you reach the entrance of the area leading to the Taj it will seem like forever, particularly on a busy Sunday. So you wonder how the King and his men thought of such a location and went about building one of the finest monuments in the world. Even the world's most beautiful girl will age but the Taj will not. The monument is so beautiful you just want to keep looking at all day long. For me even if the most beautiful girl had been there that day, she would have been ignored in the presence of the Taj. The other thing that came to my mind is the incredible perfection of the construction or should I say the epitome of beauty and perfection in a building. Stunning symmetry, perfect and flawless geometry are what awaits you. Even small lines and circles on each of the four minarets are the same in size, proportion and position. Then comes the intricate hand work, fine Jali's in marble, inlay work using semi precious stones (several of them scooped out too), and carving done on marble, all there to drop your jaws wide. The calligraphy is the other thing that you will not be able to ignore. It is so beautiful that Shahjahan is supposed to have rewarded the calligrapher. I can only wonder how they made such precise measurements to write the verses of the Koran in beautiful Arabic. I can hardly imagine how the Taj must have looked when it was in its pristine condition in 1653 A.D, 360 years ago. Shining a light close through the marble (guide's suggestion) you'll notice the high quality of the marble that almost lets the light through as though it were translucent and how the inlay work just lights up. What always blows me away is the construction of this wonder that took place at a time when there was no computer, no CAD or CAM, calculators, engineering colleges or universities, when even no cement. Most of the fountains that were operational used natural pressure to function, no motors or pumps. 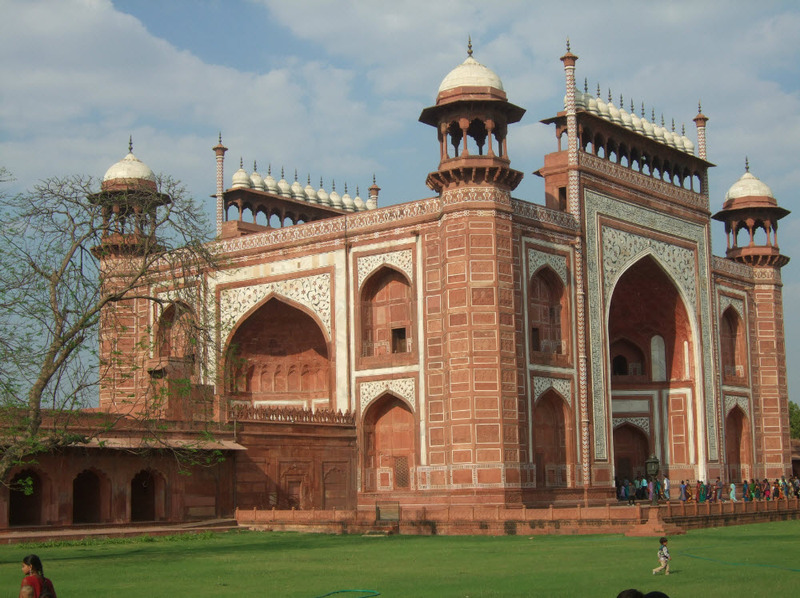 The gardens were later replaced or improvised by ones under the British rule. I also got this rude shock as to what are I was doing with my life. Even the smallest worker on this monument seems to have accomplished something worthwhile in this life. I also wonder what did a day in the life of a worker or an architect or an engineer working on the Taj, felt like. Honestly, go alone, bask in its beauty and solitude that will make your mind think wonderful things instead of going with big company and wasting a lot of that "thinking time" on chatting. Ideally I would like to spend one full day here. 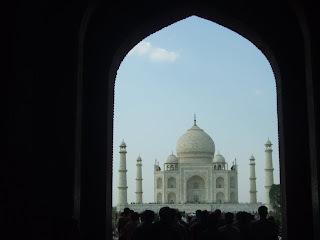 This was my last shot of the Taj as we were reclining in the benches on the lawn. Take a guide. You'll find many. They actually help you move through lengthy queues and stubborn security folks much faster. Talk to them and unless they sound like quacks, hire one of them. They also fill you with a load of crap but you can ignore them like the Black replica of the Taj that Shahjahan was trying to build acroos the Yamuna and such. Make sure you pick up shoe and slipper wraps when you buy your tickets (Guide's suggestion) because if you don't you will have to remove your footwear when you climb up the Taj. Cannot wait to visit it again. This time I want to visit The Taj on a full moon day which I believe is when The Taj is at its romantic best and also the most beautiful to watch. In a recent interview I heard Amitabh Bachan mention how one of his Pakistani friends would tell him that in Pakistan they had everything that India had except for two incredibly beautiful things. One, the Taj Mahal and the other Lata Mangeshkar. If you are Indian, you MUST visit this wonder before you die.